I have often believed that Lionel Richie clearly never got three children ready for church on Sunday morning. Then I read the lyrics today. I love when I get a spiritual application from a secular source. First though, a little background. The devil showed up to our house this morning in this form. Now, it is easy to understand why a 4 (Heaven help me almost 5!) year old boy would insist on wearing these to church with his green jeans and his light blue Hawaiian shirt with green alligators on it. It’s totally pre-school Hipster. I get that. However, they are two sizes too big. I didn’t want him tripping and falling all morning. I had his better interest (and the sanity of his teachers) in mind when I said no. It was not a fashion issue. I’m that mom that really tries to let them have their own personality in their clothing choices for the most part. Had they fit, he would have worn them. He came to me ready for a fight. He KNEW I was going to say no. I was also running at least 15 minutes behind schedule and trying to scramble eggs and cheese for breakfast, still had wet hair, and was dealing with a screaming toddler that insisted on having his sippy cup NOW!!!!! The following is a dramatic re-enactment. He had made up his mind, and nothing was going to change it. 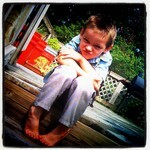 Not his black canvas high tops, not his cowboy boots, not his Toy Story light up sandals. 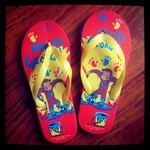 It had to be the Curious George flip flops. He gets it from me. By “it” I don’t just mean choice taste in footwear, but also his stubborn streak. Annnnnnnnd I happen to know that my mom probably needs therapy from dealing with the preschooler that was Sasha. She really likes to tell the stories. Just ask her about the “pew kicking incident” sometime. So, I did what any overwhelmed mother juggling a hot frying pan and a slimy sippy cup would have done. I sent him to his father, and sure enough he came back upstairs, somewhat calmer, but still quietly seething and put his flip flops away. Later as I was down stairs doing my final primp, he came to talk to talk to his daddy one more time about the assignment which had been given. He had chosen another pair of shoes that were this time too small and the melt down was on the verge of starting all over again. Daddy calmly talked to him, agreeing to go help him find an appropriate pair of shoes. He also took the time to ask him if his attitude was right, and if he was acting appropriately to get what he wanted. An apology was necessary, but no good if he didn’t mean it. I want my kids to mean it when they are sorry. I’ve realized that I have fallen into the trap that our culture has set, where when they screw up we demand that they apologize right away. I’m all for teaching them that they need to apologize, but I’ve realized that I’m not really accomplishing anything at all unless there is a heart change when they say it. A coerced apology is useless. He DID recognize that he was wrong. And I’ll not forget his face as he ran to me with a sincere tearful apology that was not prompted as an expectation. How often do we as adults though, just go through the motions of apology? Or worse, how often do we demand that we be apologized to? Does a coerced apology really mean anything to us anyway? Does an apology with out contrition do any good at all, or is it that we just need recognition that we are right? Does that verbal white flag really change anyone’s heart? While I still don’t always feel that Sunday morning is easy, I get what he’s saying here. But maybe from a different perspective. Apologies can heal, no doubt. But only sincere ones. When we stand in our pride and demand that we be justified, we lose the opportunity to forgive regardless. Forgiveness, just like an apology, is also no good without out a heart change. When we demand something (an apology) before we forgive, we just made the forgiveness useless. I think it would do so many of us so much more good if we could just make our hearts a little more easy.